ARECIBO, Puerto Rico—When Howard University student Jasmine Stevens fled New Orleans in 2005 to avoid Hurricane Katrina, she left with just enough clothes for two days. The Category 3 storm would cover her family’s neighborhood in eight-feet of water, destroy their belongings and force them to abandon their home and flee to Port Arthur, Texas, where they remained for three years. Now, Stevens, a junior biology major, finds herself in a familiar spot, but this time hundreds of miles away in Puerto Rico, where another hurricane has wreaked havoc on the lives of millions of Americans. Stevens is here with fellow Howard students to help the people still recovering from Hurricane Maria, which six months ago destroyed thousands of homes, wiped out the island’s already out-of-date electric grid, and limited access to clean drinking water for millions. Most of the island now has electricity and water, but the restoration of destroyed homes, businesses and churches continues. 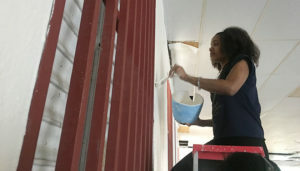 Stevens and six other Howard students spent Monday rebuilding La Hermosa Church in downtown Arecibo, a town of 96,000 on the island’s northern coast. Stevens, who is participating in Howard University’s Alternative Spring Break (ASB) program, traveled to Puerto Rico during her spring break to assist in recovery efforts. The students in Puerto Rico and more than 700 other Howard students have given up their vacation week, the parties and trips home to help people in various distressed areas, including Haiti, Anguilla, St. Martin, St. Thomas, Flint, Mich., New Orleans, Chicago, Texas and Florida. “I believe that, as a global citizen, it’s important to help those in need,” said Ngodoo Iye, 21, a senior on her third ASB trip. “For me, this trip is a way to give back to those who helped my family when we were victims of Hurricane Katrina,” Stevens said. Once a place of worship for a congregation of about 40 people, La Hermosa Church remains without power and running water. After the storm, the 12,000-square foot, one-story building church was submerged in at least eight-feet of water, said La Hermosa’s pastor, Miguel Asegarra. Asegarra has led the church for two years. He lives 15-minutes away in a residential neighborhood. La Hermosa rests in the city’s downtown, which was flooded by the Rio Grande Arecibo, a river just blocks away. The Howard students picked up restoration of the church where several other groups left off. The church, once covered in mud and debris, had been cleaned and gutted by previous groups. The ASB team was tasked with repainting the church’s walls. The church was one of dozens of buildings—businesses, homes, schools, government offices—that were severely damaged in Arecibo, which lies about an hour and a half west of the capital city of San Juan. Irma Sierra Cordova, owner of a downtown pharmacy, said she used her savings to re-open her business, which closed for two months. Others are still repairing homes ripped apart by the fierce winds of the storm. While Stevens’ team worked on the church, other Howard students helped restore a building in nearby Dorado. A third group visited the local Boys and Girls Club in Las Magaritas, a neighborhood in San Juan. While there, they tutored older students and danced and played hide-and-seek with the younger ones. They taught the kids the “Cha Cha Slide” and the students taught them salsa. Pastor Humberto Pizarro of Connected Life, a ministry in San Juan, helped Howard’s ASB program connect with those most in need. Pizarro’s church organization, Shining Bright International, is a missionary and outreach ministry that has helped more than 40 teams from the United States and the Caribbean work more than 240,000 volunteer hours to restore the island. “God has trained us for this, and we hit the ground running,” Pizarro said. Within two days after the hurricane, his church began delivering meals, fuel and water to residents, and by the end of the week, they had flown in their first group of helpers from the U.S. mainland. Howard student Audre’ana Ellis said she was impressed with the work Pizarro’s church had done to move recovery efforts along.